Mahatma Gandhi at the beginning of his career was a dapper young man, who had studied law at University College London and was a member of Inner Temple. His manners and way of dressing were totally British. A few years after completing his studies and after a brief stint in India he came to Durban to work as legal advisor for an Indian firm based in South Africa. It was here that Gandhi came face to face with the stark reality of racial discrimination. 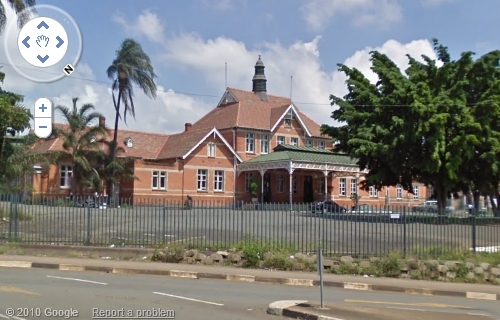 Within a week of his arrival, while travelling from Durban to Pretoria, he was asked to leave the first class compartment although he held valid ticket for first class. He refused to leave and was forcefully ejected from the train at Pietermaritzburg Station, where he spent a cold night on the platform. This event, which took place on the night of June 7 1893, was the turning point in his life which led him to fight for racial equality and human rights. 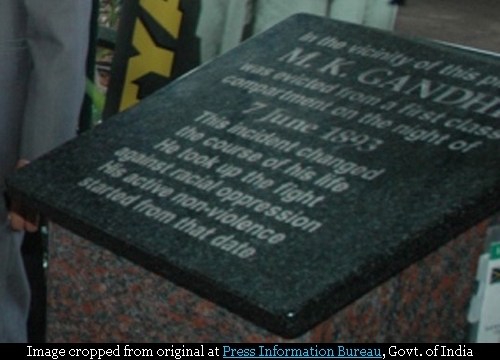 In a sense the foundation stone for his philosophy of non-violence and fight against the discrimination and colonial rule were laid at Pietermaritzburg (aka as Maritzburg) Station and in recognition of the far reaching historical impact of the event, a plaque has been erected on the platform near the spot where he was thrown out. Image from Press Information Bureau is used here under general permission. Here is the video clip of the historic event as depicted in Richard Attenborough's award winning movie "Gandhi".